With large imposing cylindrical uprights, the Pluto 500mm(w) x 800mm(h) heated towel rail exudes power and performance which will beautifully enhance both contemporary traditional interiors alike. Its slim projection at just 100mm this towel rail is an ideal option for heating bathrooms where wall space is at a premium. 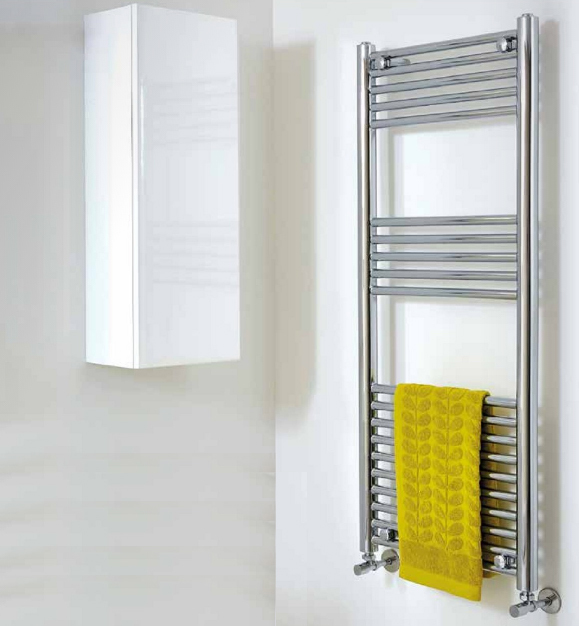 The Pluto towel rail can be installed on a central heating system, fitted as a stand alone electric unit or as dual fuel towel rail for maximum efficiency. Why Buy This Chrome Designer Towel Rail? "With large imposing cylindrical uprights, the Pluto 500mm(w) x 800mm(h) heated towel rail exudes power and performance which will beautifully enhance both contemporary traditional interiors alike. Its slim projection at just 100mm this towel rail is an ideal option for heating bathrooms where wall space is at a premium. The Pluto towel rail can be installed on a central heating system, fitted as a stand alone electric unit or as dual fuel towel rail for maximum efficiency." - Our range of designer towel rails are modelled in house and manufactured at our modern factory. - We have designed the bar patterns of the towel rails to optimise the volume of horizontal bars for heat output with spaces for functionality to allow you to hang your towels. - This towel rail is supplied with a 10 year manufacturer guarantee. (Euronorm BS EN 442). NOTE: Please do not compare this product with cheap imports, which will be aesthetically less appealing, have a poor finish and a reduced heat output.